Patients with diabetes insipidus present with polyuria, urinary output > 3 L per day and can be central or nephrogenic in origin. In central diabetes insipidus, there is a decrease in the secretion of antidiuretic hormone (ADH), while in nephrogenic diabetes insipidus, the kidneys are unable to concentrate the urine due to ADH resistance. Diabetes insipidus (DI) is an uncommon medical condition caused by the decreased secretion or action of antidiuretic hormone (ADH), a.k.a. vasopressin. This condition is characterized by polyuria (urinary output of more than 3 L per day) and hypo-osmolar urine (the urinary osmolality < 300 mOsm/kg). There are two forms of diabetes insipidus: central DI and nephrogenic DI. In the central form of the disease, there is a decreased secretion of antidiuretic hormone (ADH). On the other hand, nephrogenic DI is characterized by the inability of the kidneys to concentrate urine despite the availability of ADH. This is known as ADH resistance. The pituitary gland (hypophysis) lies in a pocket (hypophyseal/sphenoidal fossa) of the sphenoid bone at the base of the brain. It is divided into the anterior (adenohypophysis) and the posterior (neurohypophysis) pituitary glands. The neurohypophysis is controlled by the nervous system and only produces two hormones: vasopressin and oxytocin. Antidiuretic hormone (ADH), also known as vasopressin, regulates body water levels and blood pressure. Oxytocin, on the other hand, plays important roles in parturition and breastfeeding. ADH is synthesized in the suprachiasmatic nuclei of the hypothalamus and is ultimately transported to the posterior part of the pituitary via the stalk of the pituitary. ADH release normally occurs following stimulation of osmoreceptors, usually due to increased plasma osmolality. ADH acts on V2 receptors at the distal kidney tubule and the collecting duct by causing insertion of aquaporin channels, which increases the collecting ducts’ permeability to water. This, in turn, causes reabsorption of water to occur, as water enters the hypertonic interstitium of the renal pyramids, thus concentrating the urine. In the absence of ADH, the urine is hypotonic to plasma (dilute urine), urine volume is increased, and there is net water loss leading to the increased osmolality of body fluids. 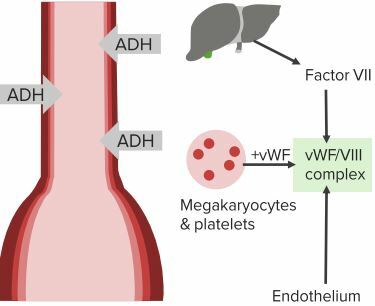 ADH also promotes the release of von Willebrand factor and factor VIII from the endothelium. This is important pharmacologically as vasopressin analogs are used in the management of von Willebrand Disease (vWD) type I and Hemophilia A. At supra-physiologic levels, ADH acts on V1 receptors to cause vasoconstriction, hence the term vasopressin. Diabetes insipidus is uncommon in the United States and has a prevalence of 3 cases per 100,000 individuals. Additionally, DI is neither gender-related nor linked to certain race or ethnic group. DI is often an acquired disorder but 1-2% of the cases are believed to be hereditary. Central DI and nephrogenic DI have different etiologies and are discussed separately. An antidiuretic hormone is produced by the hypothalamus and secreted by the posterior pituitary gland (neurohypophysis). Therefore, central DI is often related to a pituitary defect that leads to a decrease in ADH secretion. Brain and pituitary tumors, cranial surgery and head trauma are the three most common causes of central diabetes insipidus. The etiology of one-third of the cases is attributed to an unknown cause. It is important to note that the term “idiopathic central DI” is not accurate. 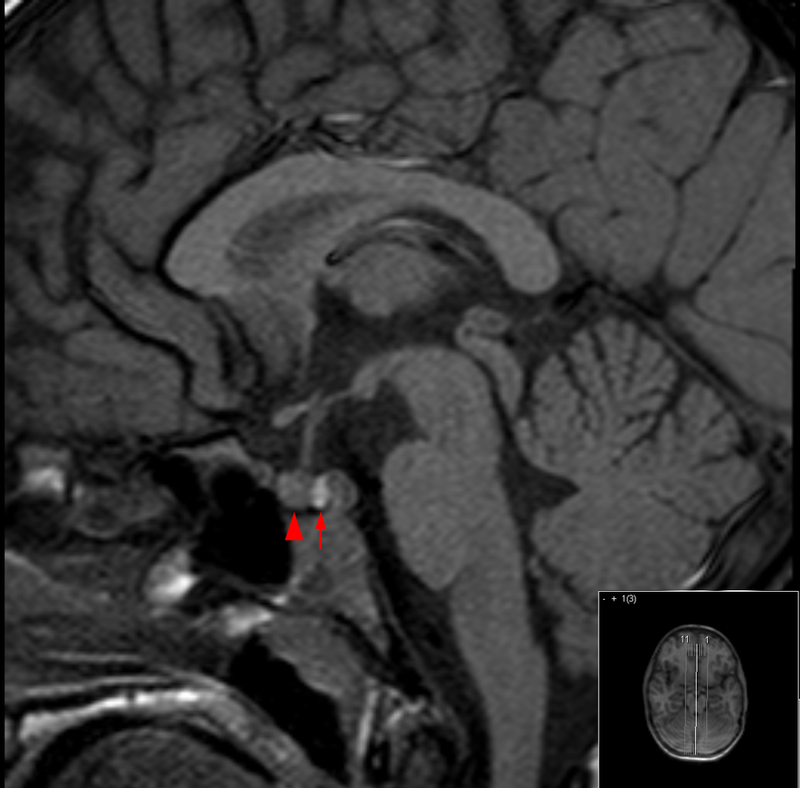 Advanced high-resolution MRI has pointed out the majority of these cases to an abnormality in the hypothalamus. Additionally, a larger number of the patients previously diagnosed with idiopathic central DI have been found to have antibodies against ADH-secreting cells, thus emphasizing the role of autoimmunity. 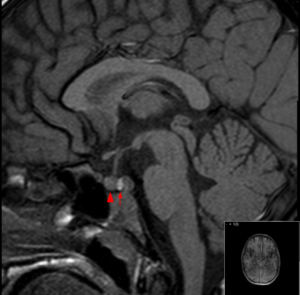 Craniopharyngiomas and pineal tumors are the most common CNS tumors associated with DI. Surgeries on the pituitary gland, especially open traditional approaches, are associated with central DI in about 80% of the cases. Surgical central DI is usually temporary and resolves in about 3 months in 90% of the cases. Finally, severe head trauma, especially if accompanied by subarachnoid hemorrhage, has been associated with an increased risk of central DI which could become chronic. The most common cause of central diabetes insipidus is idiopathic CDI (autoimmune antibody-mediated destruction of the vasopressin secreting hypothalamic cells). 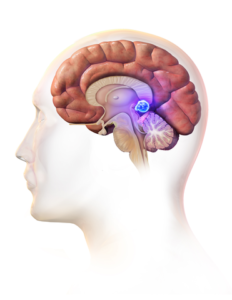 Central DI after trauma or neurosurgery to or around the region of the pituitary and hypothalamus is also common. This lesion may exhibit one of the following 3 patterns: transient, permanent, triphasic, with the latter being observed more often clinically. Tumors, both primary (pituitary tumors) and secondary, may result in central diabetes insipidus. Tumor infiltration such as by craniopharyngiomas, nearby vascular tumors or metastases from other areas such as the lung are examples of secondary causes. Hereditary causes: diabetes insipidus may rarely be inherited via inheritance patterns such as both autosomal dominant and recessive, resulting in defects in the ADH gene. This leads to the problem in the synthesis of ADH. An example of an inherited syndrome that results in an ADH dysregulation, among other things, is the Wolfram syndrome. Wolfram syndrome is a rare autosomal recessive disorder where the patient presents with Diabetes Insipidus, Diabetes Mellitus, Optic Atrophy and Deafness (DIDMOAD). Nephrogenic DI is commonly encountered in patients with lithium toxicity, hypokalemia, and hypercalcemia, though patients with chronic kidney disease could also develop DI. Lithium causes dysfunction of the collecting duct in the kidneys and this manifests as an inability to concentrate the urine. Sickle cell disease and amyloidosis are also linked to nephrogenic DI. Other medications linked to nephrogenic DI include amphotericin B, ofloxacin, and orlistat. Pregnancy may also transiently cause gestational diabetes insipidus, which usually resolves after delivery. Hereditary forms of DI are rare and account for approximately 10% of central DI cases and 1% of nephrogenic DI. Mutations in the arginine-vasopressin NP2 gene (AVP-NP2) on chromosome 20p13 are associated with a mutated and toxic form of ADH that eventually leads to the destruction of ADH secreting cells and ADH deficiency. AVP-receptor-2-gene mutations on chromosome Xq28 result in nephrogenic DI due to ADH resistance. Water balance regulation is dependent on three main factors: thirst, ADH and the kidneys. A failure in any of these three factors would eventually result in DI. Physiologically, ADH increases the water reabsorption in the collecting ducts of the nephrons and regulate the water content of the body. In dehydration, the secretion of ADH increases to reabsorb more free water. In the absence of ADH (central DI), and when the kidneys are resistant to ADH (nephrogenic DI), the water cannot be reabsorbed. Instead, it is increasingly excreted by the kidneys, which produce a high volume of diluted urine. Defect in the supraopticohypophyseal tract responsible for the transport of ADH to the pituitary for secretion. In nephrogenic DI, the kidneys lose the ability to concentrate the urine due to ADH resistance. Patients with DI present with polyuria, polydipsia, and nocturia. Nocturia, increased urination at night time, is an important manifestation of true DI, in contrast to psychogenic DI. Urinary output is more than 3 L per day and may reach up to 20 L per day. It is important to inquire about surgical and trauma history to exclude possible neurosurgery-related central DI or post-traumatic brain injury DI. Infants with hereditary DI present with crying, polyuria, and hyperthermia due to dehydration. At later stages, these infants show growth retardation and weight loss. If the patient’s etiology has also affected the anterior pituitary, other hormonal deficiencies can also be evident. A physical examination is not very helpful in these patients unless there is limited access to free water and then dehydration will be appreciated. An enlarged urinary bladder can be identified in patients with DI. Symptoms of hypernatremia can also be present: lethargy, thirst, weakness, irritability, confusion, convulsions and even coma. Though rare, there is a probability of DI-related death. The reason for the fatal end is the associated dehydration, the increase in the serum sodium concentration and cardiovascular collapse. 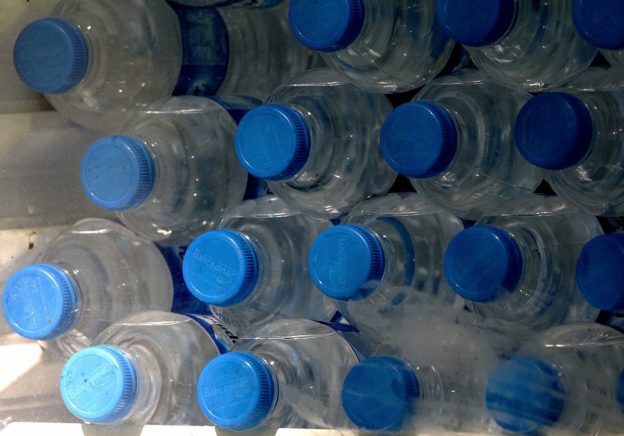 Due to excess water loss, severe dehydration may occur in some of the cases. The dehydration will manifest with confusion and irritability, dizziness, headache, and mouth dryness. Due to the usual diabetes insipidus treatment, such as desmopressin and other therapy, fluid accumulation may occur. It could lead to hyponatremia (with symptoms like headache, vomiting, seizures). This is prevented by means of monitoring the sodium levels after starting therapy with desmopressin. If the thirst is not adequately sated or there is no access to water, this leads to the development of hypernatremia and all its associated clinical manifestations. The first and most important step in the diagnostic workup of a patient suspected to have DI, is confirming a urinary output volume of more than 3 L per day. A 24-hour urine collection is indicated. A urine output of less than 2 L per day without hypernatremia excludes DI. Another important criterion for the diagnosis of DI is the confirmation of low urinary osmolality (< 300 mOsm/kg) or low urinary specific gravity (< 1.005) in the presence of raised plasma osmolality (>287 mOsm/kg). A supervised water deprivation test may be performed to confirm DI. The urine specific gravity, urine osmolarity, plasma osmolarity, serum sodium and body weight are measured every hour. The urine specific gravity of < 1.005 and/or urinary osmolality of < 300 mOsm/Kg confirms the diagnosis of DI when body weight reduces by 5% or the patient has developed hypernatremia and/or increased serum osmolarity. If serum ADH levels are normal, the diagnosis of nephrogenic DI is concluded. If serum ADH levels are low, the diagnosis of central DI is established. Patients with primary polydipsia have a low plasma osmolarity, along with increased urine volume and decreased urine osmolarity. An “ADH challenge test” may be performed to differentiate between central and nephrogenic DI. A synthetic ADH (desmopressin) is given to the patient then urine volume and urine osmolarity are measured. In central DI, urine volume will be decreased and urine osmolarity will increase due to the increased reabsorption of free water. In nephrogenic DI, there will be no change or slight change as there is persistent resistance to the ADH. Other laboratory investigations are also helpful in patients with DI and include serum electrolytes and glucose. In patients with nephrogenic DI, serum calcium can be elevated (hypercalcemia) and serum potassium can be low (hypokalemia). Brain imaging with high-resolution MRI can reveal loss of hyperintensity of the posterior pituitary on T1-weighted images in central DI. Measurement of other pituitary hormones is indicated if the patient has symptoms attributed to panhypopituitarism. The majority of the patients with DI can drink enough water to replace fluid loss. However, if the patient is unable to drink water, then intravenous fluid replacement therapy is indicated. Patients with dehydration due to DI present with hypernatremia, and slow correction of hypernatremia is needed. The aim should be to reduce serum sodium by 0.5 mEq/L per hour, and this can be achieved by a fluid flow rate of 500 mL/h. In central DI, desmopressin can be used to replace ADH. Desmopressin is available in intranasal, oral and parenteral formulations and should be administered 2-3 times per day. If desmopressin is not enough to correct central DI, indomethacin, and carbamazepine can be used as adjunctive therapy. Patients with nephrogenic DI might also benefit from indomethacin. Discontinuation of lithium or other offending drugs in nephrogenic DI can also be helpful. If the cause of nephrogenic DI is hypercalcemia or hypokalemia, these electrolyte imbalances should be appropriately treated. Unfortunately, recent advances in neurosurgical techniques only marginally reduce the risk of postoperative DI. Currently, the best option to treat postoperative DI is to use recurrent fluid intake and urinary output measurements to closely monitor patients who undergo pituitary surgery. The majority of these cases develop only temporary DI and are resolved spontaneously. The disease cannot be prevented. However, the complications which develop in its course can be avoided by means of adopting the right therapeutic regimen, including appropriate dose modification for the desmopressin. The prompt treatment of the head trauma and the space-occupying lesion of the CNS also helps in preventing the development of this condition. Barrett, K. E., Barman, S. M., Boitano, S., & Brooks, H. L. (2012). Endocrine and Reproductive Physiology. In Ganong’s Review of Medical Physiology (p. 299). The McGraw-Hill Companies, Inc.
Crook, M. A. (2012). The hypothalamus and pituitary gland. In Clinical Biochemistry and Metabolic Medicine (pp. 116-123). Hodder Arnold. Kumar, V., Abbas, A. K., & Aster, J. C. (2013). Endocrine System. In Robbins Basic Pathology (pp. 716-762). Elsevier Saunders. Longmore, M., Wilkinson, I. B., Davidson, E. H., Foulkes, A., & Mafi, A. R. (2012). Endocrinology. In Oxford Handbook of Clinical Medicine (p. 196). Oxford University Press. I have really enjoyed the study, it’s good to have the lecturio.